The narrow gate is faith and also the way of faith: prayer, and especially the perfect prayer of the liturgy, the prayer of Jesus Christ Himself. A most blessed Lord's Day to all of God's holy people! 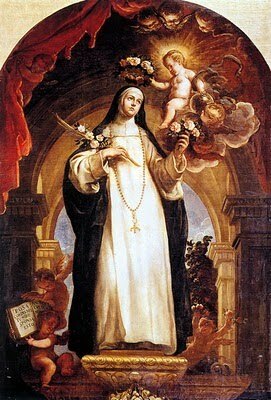 S Rose of Lima: "regarding your endurance and faith in all your persecutions and the afflictions you endure"
so that you may be considered worthy of the Kingdom of God for which you are suffering. The Queenship of the Blessed Virgin Mary: "The greatest among you must be your servant." Mary's prayer is revealed to us at the dawning of the fullness of time. Before the incarnation of the Son of God, and before the outpouring of the Holy Spirit, her prayer cooperates in a unique way with the Father's plan of loving kindness: at the Annunciation, for Christ's conception; at Pentecost, for the formation of the Church, his Body. In the faith of his humble handmaid, the Gift of God found the acceptance he had awaited from the beginning of time. She whom the Almighty made "full of grace" responds by offering her whole being: "Behold I am the handmaid of the Lord; let it be [done] to me according to your word." 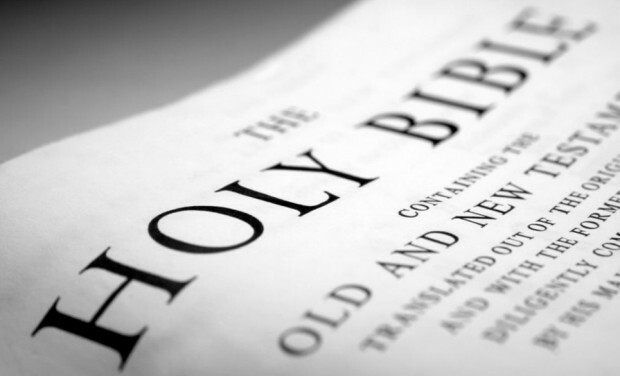 "Fiat": this is Christian prayer: to be wholly God's, because he is wholly ours. S Pius X. "Are you envious because I am generous?" Thus, the last will be first, and the first will be last. The baptized person combats envy through good-will, humility, and abandonment to the providence of God. S Bernard: “Amen, I say to you, it will be hard for one who is rich to enter the Kingdom of heaven." “Amen, I say to you that you who have followed me, in the new age, when the Son of Man is seated on his throne of glory, will yourselves sit on twelve thrones, judging the twelve tribes of Israel. And everyone who has given up houses or brothers or sisters or father or mother or children or lands for the sake of my name will receive a hundred times more, and will inherit eternal life." All Christ's faithful are to "direct their affections rightly, lest they be hindered in their pursuit of perfect charity by the use of worldly things and by an adherence to riches which is contrary to the spirit of evangelical poverty." Art: Bernard exorcising a possession, altarpiece by Jörg Breu the Elder, c. 1500. S John Eudes: "Come, follow Me"
"If you wish to be perfect, go, sell what you have and give to the poor, and you will have treasure in heaven." To this first reply Jesus adds a second: "If you would be perfect, go, sell what you possess and give to the poor, and you will have treasure in heaven; and come, follow me." This reply does not do away with the first: following Jesus Christ involves keeping the Commandments. The Law has not been abolished, but rather man is invited to rediscover it in the person of his Master who is its perfect fulfillment. In the three synoptic Gospels, Jesus' call to the rich young man to follow him, in the obedience of a disciple and in the observance of the Commandments, is joined to the call to poverty and chastity. The evangelical counsels are inseparable from the Commandments. 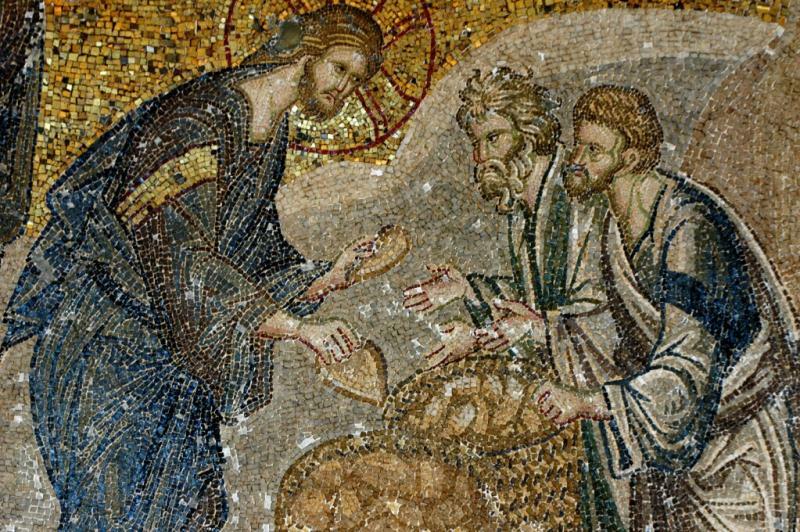 Twentieth Sunday, Ordinary Time: "Do you think I have come to spread peace upon the earth?" When families experience disagreements about religious faith they sometimes make the tragic error of rejecting it completely by, for example, agreeing not to speak of it between themselves or falling away from Sunday Mass, seeking a false kind of peace which cannot save because it is not based upon the truth, upon Christ. One of the most difficult things that I do as a priest is to announce at funerals, weddings or other events which include Mass that, because of sin or division, some present may not be properly prepared to receive the Eucharist. I see at times like that the real divisions within families over Faith but also that the greatest tragedy of all would be to reject Christ in reaction against this phenomenon within families. I am thankful for every person who is present and pray they may encounter Him in His Church. 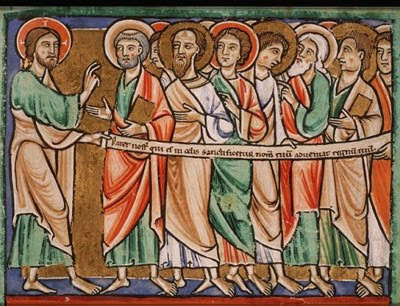 Christ makes clear in the Gospel that His Presence may sometimes be experienced by us as a kind of division, an uncomfortable distance between us and those we love, for He forces a decision upon us: we must choose either He Who is the Truth or a lie. He says there is no middle way. 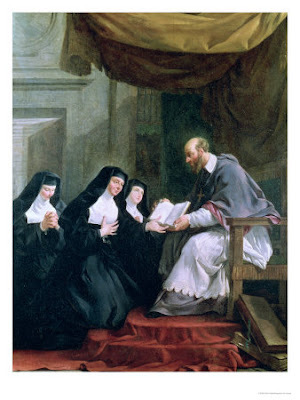 Saint Jane Frances de Chantal: "Do not forget the works of the Lord!" Religious life derives from the mystery of the Church. It is a gift she has received from her Lord, a gift she offers as a stable way of life to the faithful called by God to profess the counsels. Thus, the Church can both show forth Christ and acknowledge herself to be the Savior's bride. Religious life in its various forms is called to signify the very charity of God in the language of our time. Everyone experiences the fear of suffering. What is the fear of death or disease, the fear of the loss of security financial or physical, of the unknown future but a fear of suffering? We call these physical evils because they diminish or destroy the body, mind or soul. But there are also spiritual evils, such as sin, and these are far more to be feared, as our Lord teaches us, because they can "cast both body and soul in Gehenna". To fear these is "salutary" that is, a help to our salvation. These kinds of fear are not what the Lord is talking about in today's Gospel reading: "fear of the Lord" is a gift of the Holy Spirit. And why do we fear suffering and evil? Because we were made by God, for Himself, who is love and life and light without beginning or end, and with whom there is never fear or suffering or death, but only abundant, infinite holiness and joy. And when we lack what God intended for us to have, then we are unhappy. Fear prevents the life of joyful and hopeful faith and the freedom to love. It was in order to restore these things to the human race that Jesus Christ came to suffer, die and rise again. Fear is a darkness at the margins of our lives, something we do many things, some unconsciously, to avoid. Some turn to alcohol, drugs, the misuse of their bodies and minds, all in a vain attempt to escape from the suffering which is brought on by fear of people, places or things in our world. Our Lord opens this subject of fear for our discussion in today's Gospel: "Do not be afraid, little flock". But then he goes further and proposes a remedy: " ... your Father is pleased to give you the Kingdom". Now, what is the Kingdom? And how does this gift of the Kingdom given by the Father promise to eradicate fear from our lives? For the full text of the homily suggestion for the Nineteenth Sunday of the Year, please visit A Priest Life. “Do not be afraid any longer, little flock"
"Sell your belongings and give alms. Provide money bags for yourselves that do not wear out, an inexhaustible treasure in heaven that no thief can reach nor moth destroy." "For where your treasure is, there also will your heart be." Is Jesus Christ your Treasure? How will you give Him your heart? 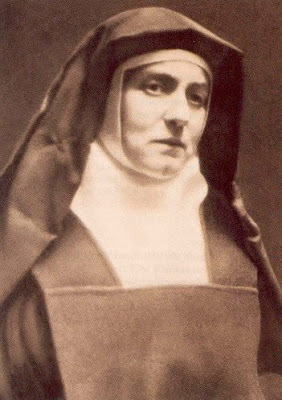 S. Lawrence, deacon and martyr: "Unless a grain of wheat falls to the ground and dies"
Saint Teresa Benedicta of the Cross: "The Son of Man is to be handed over to men ..."
... and they will kill him"
You have heard that it was said to the men of old, "You shall not kill: and whoever kills shall be liable to judgment." But I say to you that every one who is angry with his brother shall be liable to judgment. "Human life is sacred because from its beginning it involves the creative action of God and it remains for ever in a special relationship with the Creator, who is its sole end. God alone is the Lord of life from its beginning until its end: no one can under any circumstance claim for himself the right directly to destroy an innocent human being." “Because of your little faith. A sacramental celebration is a meeting of God's children with their Father, in Christ and the Holy Spirit; this meeting takes the form of a dialogue, through actions and words. Admittedly, the symbolic actions are already a language, but the Word of God and the response of faith have to accompany and give life to them, so that the seed of the Kingdom can bear its fruit in good soil. The liturgical actions signify what the Word of God expresses: both his free initiative and his people's response of faith. Feast of the Transfiguration of the Lord: "Jesus led them up a high mountain"
Christ's Transfiguration aims at strengthening the apostles' faith in anticipation of his Passion: the ascent on to the "high mountain" prepares for the ascent to Calvary. Christ, Head of the Church, manifests what his Body contains and radiates in the sacraments: "the hope of glory" (Col 1:27; cf. : St. Leo the Great, Sermo 51, 3: PL 54, 310C). "... give them some food yourselves." A young man passes the church in his truck and makes the sign of the Cross. A couple distraught over the illness of a newborn grandson stop at the rectory to ask the priest to pray with them and light a candle in the church. A mother grieving over the death of a son and a catechist who discovers he disagrees with a teaching of the Church both react by falling away from regular attendance at Sunday Mass. These and many more stories tell the tale of those who have gone "away" from Christ and are lacking the comfort of forgiveness and love He offers as God in His Church. As Christ tells us, "there is no need for them to go away". 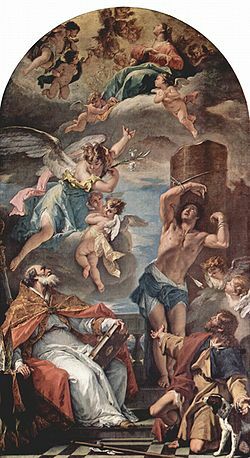 We who live so as to remain near to Christ and to grow in the grace of Faith grieve for those who are no longer with us on the Lord's Day at Mass. In loving concern we want to know what to do in order to help them. And yet we know it is not us they need but that all that they seek is found in Christ. 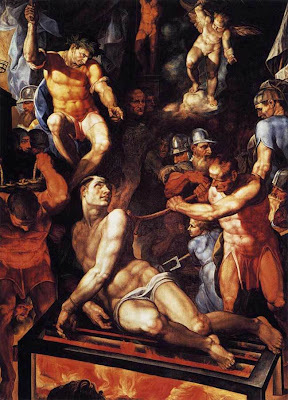 Though they may be "Catholics on leave" Christ is actively calling them back to the fold of the Church and he sends us to help him in this task. Because we are one with Christ our Eucharist there is in fact something that we can do in compassion for those who have left the fold. How can we help? "Give them some food yourselves". We work with Christ in the apostolate through the graces of prayer, witness and love which all flow from the Lord's Eucharistic Presence. This same Gift leads us and all the world back to Him as "source and summit" of the Christian life. In this way we follow the urging of Christ in today's Gospel: "give them some food". We express our faith by being witnesses to the power of God who, present in the Eucharist, has the capacity to feed and sustain every human person without exception. The same God who multiplies the loaves to satiate the hunger of the multitude with a superabundance of leftovers is the same God who gives Himself in the Eucharist. 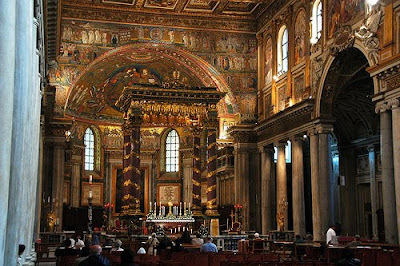 Everyone will find their needs satisfied in Christ who gives Himself in the Sacrament of the Altar. The miracle in today's gospel points to this power of God. Such is the power of our prayer in the Eucharist that we know the Father hears us in the same way as He always hears Christ the Son. This being true, we must make every effort to intercede for everyone who is faltering in their journey of Faith as we surely also have. We witness by our presence at this Holy Sacrifice to those who need to rediscover God here. The Eucharist is the source of Love needed by the world. 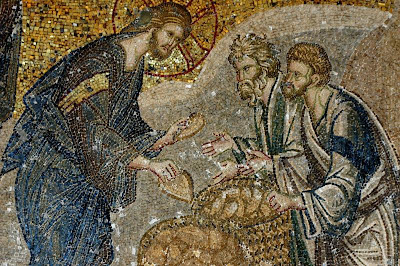 Image: Multiplication of the Loaves and Fishes, St. Savior in Chora, Istanbul. "Our Lady of the Snows" - Dedication of the Basilica of Saint Mary Major in Rome: "I also saw the holy city"
... a new Jerusalem, coming down out of heaven from God, prepared as a bride adorned for her husband. By her complete adherence to the Father's will, to his Son's redemptive work, and to every prompting of the Holy Spirit, the Virgin Mary is the Church's model of faith and charity. Thus she is a "preeminent and . 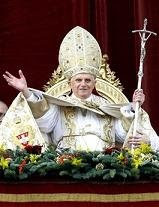 . . wholly unique member of the Church"; indeed, she is the "exemplary realization" (typus) of the Church. "After speaking of the Church, her origin, mission, and destiny, we can find no better way to conclude than by looking to Mary. In her we contemplate what the Church already is in her mystery on her own "pilgrimage of faith," and what she will be in the homeland at the end of her journey. 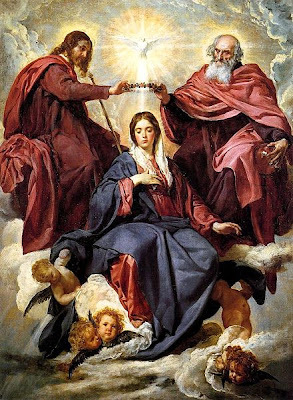 There, "in the glory of the Most Holy and Undivided Trinity," "in the communion of all the saints," the Church is awaited by the one she venerates as Mother of her Lord and as her own mother. "In the meantime the Mother of Jesus, in the glory which she possesses in body and soul in heaven, is the image and beginning of the Church as it is to be perfected in the world to come. Likewise she shines forth on earth until the day of the Lord shall come, a sign of certain hope and comfort to the pilgrim People of God." Ss Eusebius and Julian Eymard: "Whoever remains in me and I in him will bear much fruit"
... because without me you can do nothing. Holy Communion augments our union with Christ. The principal fruit of receiving the Eucharist in Holy Communion is an intimate union with Christ Jesus. Indeed, the Lord said: "He who eats my flesh and drinks my blood abides in me, and I in him." Life in Christ has its foundation in the Eucharistic banquet: "As the living Father sent me, and I live because of the Father, so he who eats me will live because of me." On the feasts of the Lord, when the faithful receive the Body of the Son, they proclaim to one another the Good News that the first fruits of life have been given, as when the angel said to Mary Magdalene, "Christ is risen!" Now too are life and resurrection conferred on whoever receives Christ.